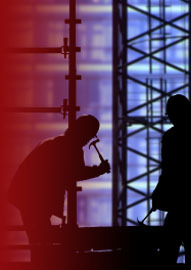 Kleinick Law - New York Law Firm specializing in New York scaffolding accidents. The lawyers at Kleinick Law represent construction workers who are injured in scaffolding accidents throughout New York City (NYC), Brooklyn, Bronx, Manhattan, and surrounding areas. Scaffolds are temporary platform structures built for workers on commercial and industrial construction sites so the workers can reach heights out of their reach. Bricklayers, painters, miners, and electricians all use scaffolds to elevate themselves in their respective trades. Scaffolds have to be constructed and sometimes when they are improperly installed the scaffolding may collapse causing death or injury to anyone on, beneath, or around the scaffold. The Occupational Safety & Health Administration (OSHA) lists over 65% of construction workers currently use scaffolds in their daily occupation. Nearly 50 people die each year because of collapsed scaffolds, and over 4,000 are injured on or as a direct cause of a faulty, defective, or improperly used scaffolds. We here at New York Construction Accident Attorneys.com will use our years of experience in handling construction and scaffold accident cases to investigate every possible factor that would cause your accident, and to ensure that you will receive full compensation for your injuries. Click here to fill out our FREE case evaluation form to ensure that you take the right steps. Your initial consultation is free “if we don’t win you don’t pay,” so call immediately. New York Scaffolding Accident Lawyer specializing in scaffold law in the state of New York. We represent injured construction workers throughout New York City (NYC), Brooklyn, Bronx, Manhattan and the surrounding areas.